The outdoor unit, or condensing unit, is part of the air conditioning system and is there to provide your home with central air conditioning year-round. But the outdoor unit also has an indoor unit, called the air handler. It is usually used in place of a gas furnace and is just as cost efficient. The air handler is the unit that circulates all of that lovely air we crave in the summer and the heat that's essential for those living in colder environments and it does so evenly throughout the home. One unit cannot work without the other, they work together to provide central air conditioning. Air handlers operate in conjunction with an air conditioning or heat pump system, are simple to the naked eye and are generally used instead of a furnace. 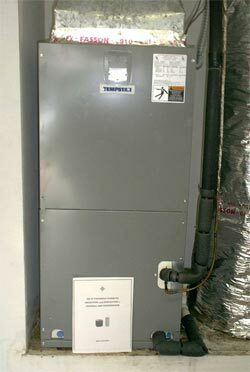 An air handler is a box made of sheet metal, with holes on each side and a fan that circulates the air. It also houses essential air conditioning parts, such as an evaporator coil and an air conditioning filter. There are various sizes and efficiency ratings of air handlers , mainly due to the different air conditioning systems . Both are matched together to provide the very best central air conditioning for the size of the home or office building. Basically, it's the part of the air conditioning system that solely focuses on the cooling of the house, while the condensing unit, or "outdoor unit," focuses on the heating. Both have the same parts yet concentrate on different functions to provide both heating and air conditioning. The air handler can also be referred to as an "indoor unit." Whenever you have to replace the outdoor air conditioning unit, you also have to do the same with the air handler because both are designed to provide the very best air conditioning system . Not matching these two air condition parts can result in insufficient heating and air conditioning you come to expect of your central air conditioning. Something not entirely new to the market but an added perk are variable speed air handlers , which pretty much operate the same as the standard but have an added bonus: a variable-speed blower that can cool (or heat depending on if you have an added heating coil) in varying speeds throughout the home instead of an on/off stronger flow that is expected of the standard air handler.